Venice Airport also known as Venice Marco Polo Airport is situated on the Italian mainland 8 km north of Venice, Italy. Venice Airport has 2 long runways and it handled about 8.6 million passengers in 2011. Venice Airport has one passenger terminal. The airport terminal has three floors, ground floor for arrivals and the first floor for departures. There are cafes, bars and restaurants at the airport. Food outlets include Italian espresso bars and a self-service restaurant. We have tie-ups with major car rental suppliers at Venice Airport such as Advantage Rent a Car, Maggiore, and Sixt. We provide a huge fleet of cars ranging from economical to luxurious cars. Venice is one of the must-see destinations of our era. A unique city of 116 islands, endless waterways, and ancient history, Venice attracts a calm pour of tourists from all corners of the world. The most well known places to visit in Venice are the Basilica di San Marco, Guggenheim collection, and Palazzo Ducale. Other places well worth seeing are Ca'Rezzonico, Ca'Pesaro Arsenale and the Basilica di Santa Maria. The Campanile di San Marco and the Doge's Palace are two instantly recognizable landmarks among many other that appear in pictures by Canaletto and Turner. The busiest times in Venice are from May till September along with Christmas and New Year. 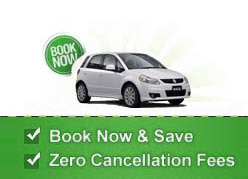 Sightseeing around Venice Airport can be made easy with a low priced car rental deal. Check our easy to book rental form given above to search for more pick up locations in Venice.